It’s surreal that the Floyd Mayweather vs. Conor McGregor boxing match is upon us, but that is exactly the case as we approach Saturday at the T-Mobile Arena in Las Vegas. Mayweather (49-0, 26 KOs), the best boxer of the last two decades, will return from a two-year retirement at the age of 40 to face the biggest name in combat sports during his absence: UFC lightweight champion Conor McGregor (21-3 in MMA). When the two fighters finally touch gloves on Saturday at T-Mobile Arena in Las Vegas (Showtime PPV, 9 p.m. ET), with strong potential to break Mayweather’s pay-per-view record of 4.6 million buys from his 2015 victory over Manny Pacquiao, a 60-day circus build will commence with an actual boxing match. Mayweather will seek his 50th career win, which would best the mythical mark of former heavyweight champion Rocky Marciano, against a brash Irishman making his pro boxing debut. McGregor, 29, has proven to be Floyd’s equal during the buildup to the fight in terms of talking trash and flaunting his business acumen, but whether or not he can equal the former pound-for-pound kind inside the ring largely remains in question. Ultimately, that’s why the fight will sell so well. The intrigue of seeing how McGregor will react in such a bizarre matchup that was literally talked into existence is the very definition of reality television. Both fighters, of course, will be handsomely paid to almost absurd levels in order for millions of fans across boxing, mixed martial arts and beyond to find out what happens. Reach 72 in. 72 in. First and foremost, what’s on the line in this one is the gratuitous amount of millions both fighters are expected to make. Mayweather, who claims to have earned upwards of $300 million when all receipts were counted from his victory over Pacquiao, expects to make even more this time while McGregor has flaunted the idea of earning $100 million (although the exact financial split will remain under wraps per a clause in the fight’s contract). Most of that money, however, is guaranteed and has just about nothing to do with what actually happens inside the ring (and more to do with how well the promotion has sold the fight.). So in terms of what’s tangibly at stake, that’s where it gets interesting. Not only is Mayweather seeking a very marketable 50th victory to finally retire on after promising his children and secretive adviser Al Haymon this would be his last, he is also in some ways protecting the reputation of his own sport against a brash neophyte like McGregor. Officially, there are no recognized titles at stake in the bout (nor should there be, with the Nevada State Athletic Commission coming under scrutiny simply for approving the matchup to begin with). 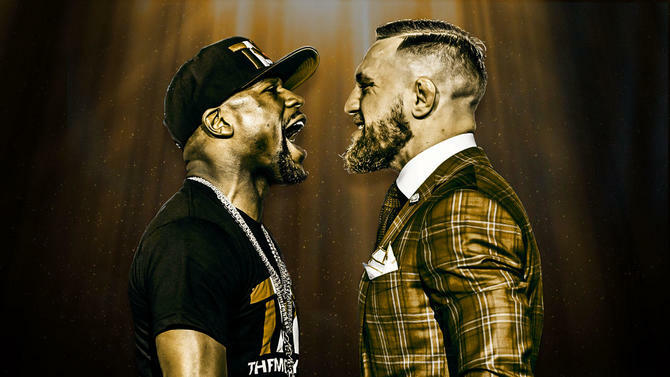 But certain records — everything from the fight’s live gate to the aforementioned PPV buys — are expected to be eclipsed because of the crossover appeal the fight has throughout popular culture. For McGregor, there’s an opportunity here to become his own generation’s Muhammad Ali when you look at it from the sense of a loud-mouth salesman who can make outrageous claims and consistently back them up to almost frighteningly accurate detail. Anyone who has followed the UFC run of “Mystic Mac” can remember how many times he has called the exact round and finish of his fights, even when entering as an underdog. A victory for the UFC’s first simultaneous two-division champion would not only be in contention for the biggest upset in sports history, it would likely open the door for McGregor to start a new career within a wild west sport that financially rewards marketable capitalists in ways that MMA is still unable to. McGregor’s star power would be elevated to unforeseen levels with a win, likely setting up a rematch that could become one of the most anticipated sporting events of this lifetime. But talking about such a scenario and actually witnessing it playing out are two entirely different things. Although McGregor has closed the gap unexpectedly well in terms of the betting odds, he remains a massive underdog from a critical standpoint. He has an uphill climb ahead of him when it comes to matching his skill set with such a battle-tested surgeon as Mayweather, who provided McGregor with little to no advantages during the fight’s negotiation.